From hot flashes to mood swings, menopause symptoms can be unpredictable and embarrassing. In the quest for relief against the various symptoms of menopause, more women are turning to hormone replacement therapy (HRT). An often controversial subject, it is not certain whether hormone therapy increases or decreases the risk of cancer, but, for many women who use HRT for short-term treatment, the benefits may outweigh the risks. Keep reading to learn about progesterone replacement therapy and its effects on menopause. Produced by the ovaries, progesterone is a pivotal hormone that has several roles within the female body, which include preparing the uterine lining for fertilization. Progesterone is also responsible for the onset of menstruation in premenopausal women. 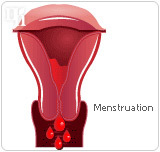 If fertilization does not occur, progesterone levels drop and the uterine lining sheds, resulting in menstruation. Progesterone also acts as the natural counterpart of estrogen and is necessary for optimum estrogen utilization. Its presence within the body sensitizes both estrogen and thyroid hormone receptor sites, which allows the body to use these hormones more effectively. All types of hormone therapy contain hormonal estrogen, which replaces the estrogen that your ovaries no longer produce. If you take estrogen alone, the lining of the uterus builds up. In turn, this can increase the risk of developing uterine cancer. Progesterone is introduced to reduce this risk. In many HRT products, the estrogen and progesterone are combined in the form of a tablet, patch, or implant. However, these hormone therapies can be taken separately. For women who have had a hysterectomy, the surgical removal of the uterus, progesterone is not taken. In 2002, a study published by Women's Health Initiative (WHI) raised concerns over the safety of HRT. This is particularly due to a possible increased risk of breast cancer with the addition of HRT, as well as a possible increased risk of heart disease. HRT does increase the risk of developing certain health problems, but this increase in risk is very small in most cases. Although it continues to be overshadowed by estrogen, progesterone is vital to a women's well-being.Consult your doctor if you're thinking of taking progesterone replacement therapy. Click here for more information on different alternatives to hormone therapy.